Joseph Preston Whitaker began his mortuary service in 1905. He and his wife, Mary Hova Whitaker, were the first generation of Whitaker Funeral Home service providers. 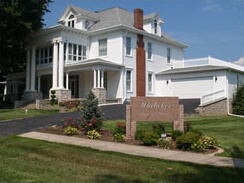 They owned and operated the Whitaker Funeral Home in Gosport, Indiana. The original facility burned in 1968. A new structure was built and remained in the Whitaker family until the 1990's when it was sold. The Whitaker Funeral Home in Cloverdale was first a residential home. The house was started in 1910 by Bert Sandy and went on the tax records in 1912. The original house had Carbide light fixtures. The original wood-work is still intact downstairs with Ionic columns all in their original finish. These, as well as all wood-work is quarter sawed Mission Finish Oak. The finish is obtained by grinding limestone into the wood then treated with clear linseed oil. This gives it a brownish gray finish. In 1937 the home was purchased by Frank and Mayme Hurst Reed. At this time the house was wired for electricity and water along with the installation of an upstairs kitchen. The house was redecorated to be utilized as a funeral home in the downstairs with living quarters upstairs. Mr. and Mrs. Reed occupied the place until Mr. Reed's death in September of 1947. Mrs. Reed then sold the property to the Whitaker family on October 17, 1947 whereby Charles and Lillian Whitaker took occupancy and ownership. Charles was second generation in Whitaker funeral services with his father, Joseph Preston Whitaker, starting the family funeral service in Gosport, Indiana. Very little change has been made to the original house. There is still a full basement with stone foundation, four fireplaces with original gas logs and mantels, beveled glass front doors, stained glass windows, and steam radiators (still in use today). In 2001 the funeral home floor space was increased to broaden the viewing area(s) for services. Remodelling and redecorating efforts (furnishings, etc.) were in keeping with the original structure and character of the facility. The Whitaker family continues to own and operate the funeral home today with John J. Whitaker (3rd generation) now retired, and his son, John Jacob Whitaker (4th generation), serving the community in funeral needs and services.